THE SECRET IS OUT! The national Collegiate Inventors Competition formally announced that the University of Utah’s Mechanical Leech team is among their elite finalists. The Collegiate Inventors Competition is a national competition that recognizes and rewards innovations, discoveries, and research by college and university students and their faculty advisors. Entries are judged on the originality and inventiveness of the new idea, process, or technology. Entries are also judged on their potential value to society (socially, environmentally, and economically), and on the scope of use. Advised by mechanical engineering professor Bruce Gale (director of the Center of Excellence for Biomedical Microfluids at the University of Utah) and University of Utah School of Medicine surgeon, Dr. Jay Agarwal (assistant professor in the Department of Surgery, Division of Plastic Surgery and Huntsman Cancer Institute Investigator), mechanical engineering students Andy Thompson, Scott Ho and Jessica Kuhlman (B.S. 2013), chose the Mechanical Leech project as their senior capstone design. Agarwal is interested in leech therapy for some of his patients and proposed the idea of a reliable functioning mechanical leech device to Dr. Bruce Gale. Gale felt it would make a nice undergraduate senior capstone project. The University of Utah Mechanical Leech mimics the functions of the biological leeches used in leech therapy. The Mechanical Leech is currently about 1” (25mm) in diameter plus additional tubing, and will eventually offer numerous size variations to accommodate the doctors’ needs. The primary customers for the Mechanical Leech are intended to be doctors and surgeons. The completed device will provide a suitable replacement for the biological leech by reducing excess fluidic pressure and injecting an anti-coagulant into patients. In addition to eliminating a patient’s adverse reaction to biological leeches, a Mechanical Leech will be able to provide more consistent, controllable performance over its parasitic counterpart, making it more desirable to doctors and surgeons to use during therapy. Alongside 22 other senior design projects, the Mechanical Leech team showcased their finished product during the Department of Mechanical Engineering Design Day last April. It was one of three projects to receive a Boeing Distinguished Project Award. Additionally, last April they finished as the runner up at the Bench to Bedside competition at the Huntsman Cancer Institute where they received a $10,000 cash award. “Mechanical Leech was in my top five project choices, but I didn’t really know what the project would be like; the title is what caught me,” says Jessica Kuhlman. “We were going to be solving a real world problem and that is the main reason I wanted to go into engineering. After the team got together, we met with Dr. Agarwal, who was crucial to our coming up with the design. Having a surgeon that has used leeches and be able to tell us how the device needs to function was very helpful. He was also a great resource regarding our potential future customers and what would make the device better and, from the doctors’ view point, more user friendly.” “The thing that is most rewarding about this project is the scope of the project,” noted Scott Ho. 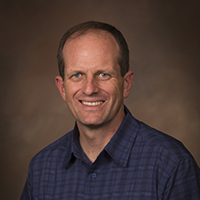 “We were able to go from a product and field research stage to exploring commercialization and really consider all aspects of the engineering process. It was a project that had a practical application in the medical field and our role in the project encompassed the entire device, not just a small section of a system” The national Collegiate Inventors Competition encourages students who actively pursue invention. Students frequently come from science, engineering, mathematics, and technology studies but creative invention can emerge from any course of study. The Competition also recognizes the working relationship between a student and his or her advisor. 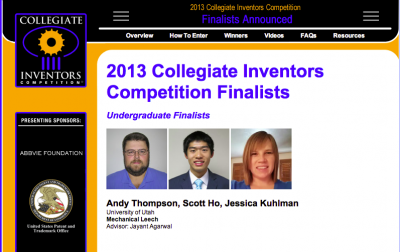 Introduced in 1990, the Collegiate Inventors Competition has recognized, rewarded, and encouraged hundreds of students to share their inventive ideas with the world. The Competition promotes exploration in invention, science, engineering, technology, and other creative endeavors and provides a window on the technologies from which society will benefit in the future. Each year, the finalists (or finalist teams) in the Graduate and Undergraduate Divisions receive all-expense paid trips to present their work to a panel of expert judges in Washington, D.C. http://www.invent.org/collegiate/finalists_2013.html The Department of Mechanical Engineering at the University of Utah is committed to providing students with broad-based, rigorous and progressive education. By combining state-of-the-art facilities with renowned faculty, the department provides an education that gives students the necessary skills to become the next generation of innovators.